Ruins of City Hospital. This was the earliest charitable endeavor of the City of St. Louis, established in 1845 to provide medical care to the indigent. 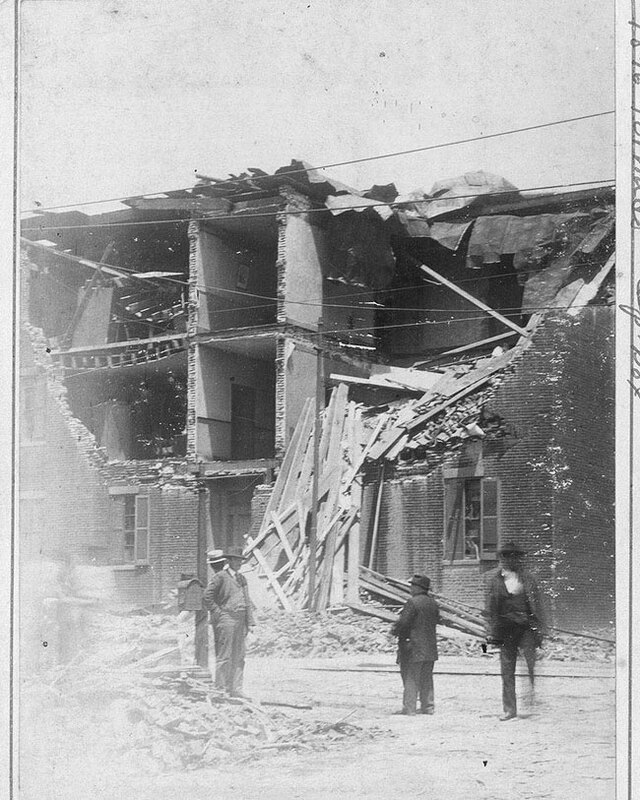 The building that the tornado destroyed, located at Lafayette Avenue and 14th Street, had been built in 1857. Its 450 patients were moved to temporary locations, but replacement structures were not finished on this site until 1905. 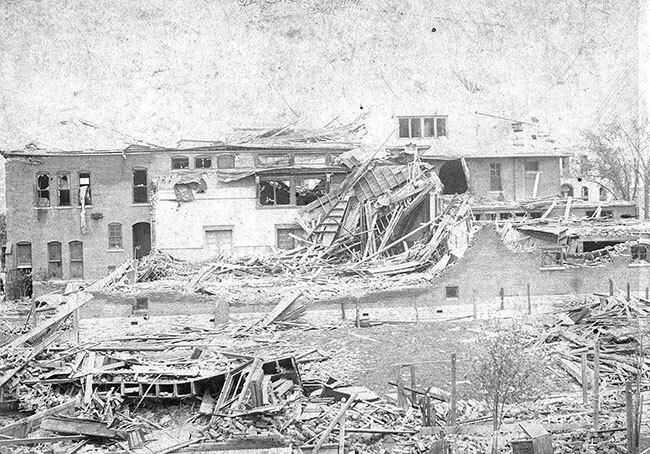 Destruction at St. Vincent’s Asylum. This hospital for the insane, located at 9th and Marion Streets in the Soulard neighborhood, was operated by the Daughters of Charity of St. Vincent de Paul. 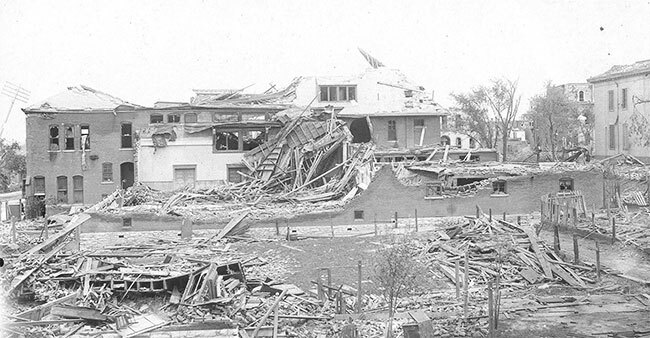 Fortunately, the building was empty when the tornado struck, the institution having been moved to a large facility in northwest St. Louis County the year before. This is the Bohemian Gymnasium, located at 9th and Allen streets in the Soulard neighborhood; it was a gathering place for the area's Czech community in the 19th century. 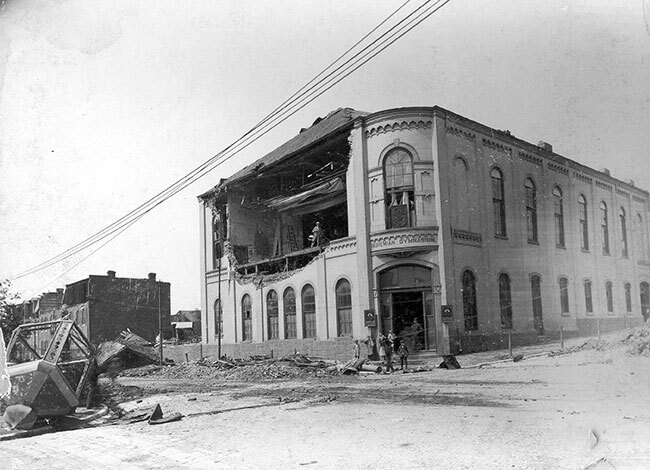 The tornado punched out one wall and blew a heavy iron cupola onto the street. 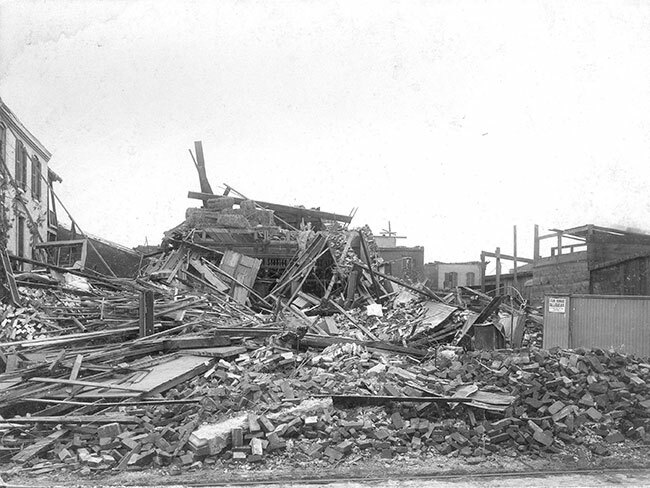 The building was repaired and still stands. It housed the Smile Soft Drink Company in the 1920s and is now known as the Smile Building. 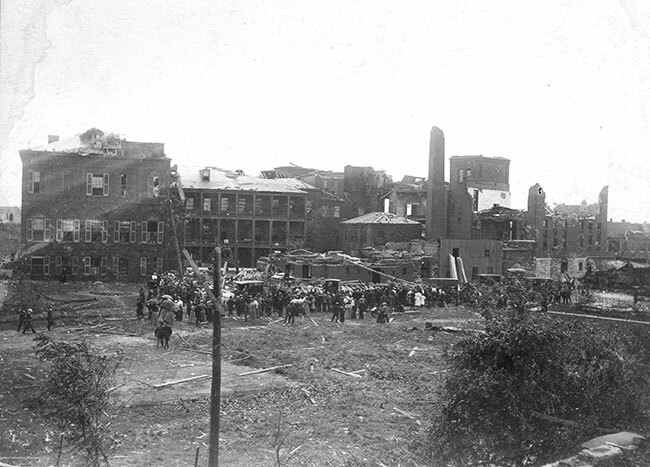 A crowd gathered to view the destruction of City Hospital. This hospital was the earliest charitable endeavor of the City of St. Louis, established in 1845 to provide medical care to the indigent. The hospital, located at Lafayette Avenue and 14th Street, had been built in 1857. Its 450 patients were moved to temporary locations, but replacement structures were not finished on this site until 1905. Ruins of the Union Club. This club stood at the corner of Lafayette and Jefferson Avenues in the Lafayette Square neighborhood, and was a leading social club for south side residents. The club was rebuilt, although in a different architectural style, on this site. 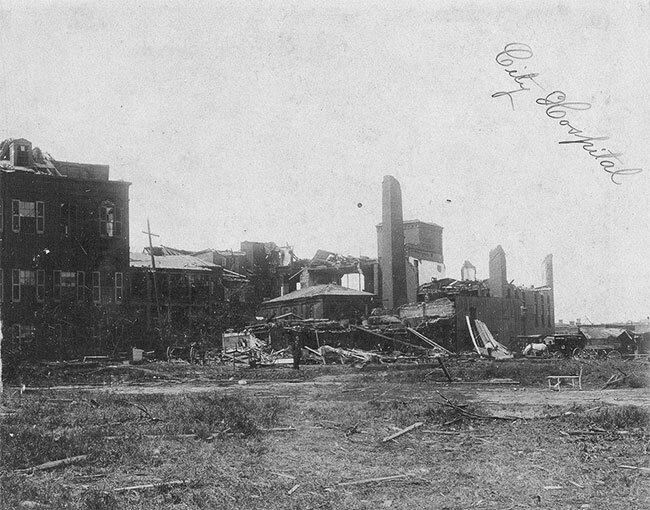 Rear view of the destroyed Union Club. Located at Lafayette and Jefferson in the Lafayette Square neighborhood, this club dated to 1891 and was a leading social club for south side residents. The club building was rebuilt on this site, although in a different architectural style. 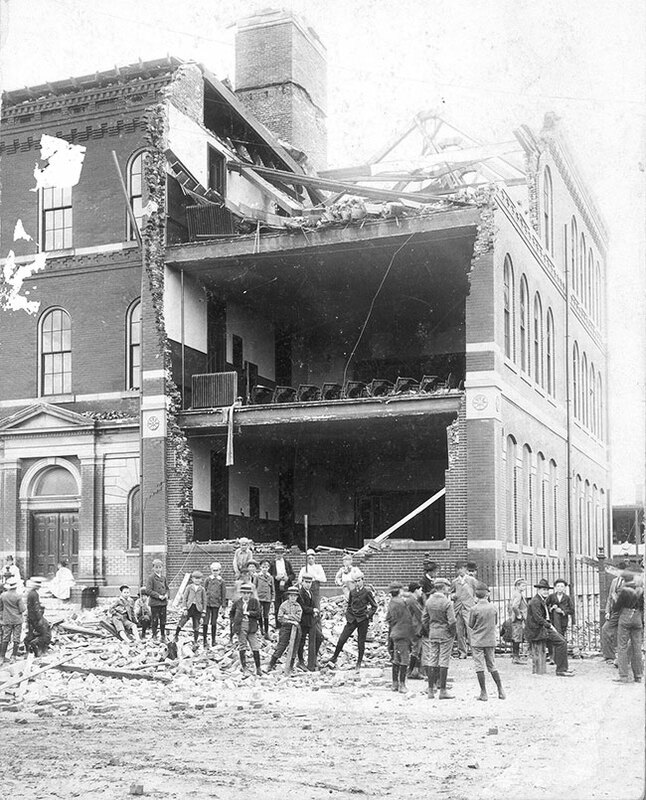 Children (mostly boys) stand in the rubble of Hodgen School. This public school was located at California and Lafayette Avenues, just west of the Lafayette Square neighborhood. Although the wall was gone, the second floor rows of desks were still in place.